Powered wheelchairs, also referred to as electric wheelchairs or powerchairs, are personal vehicles designed for indoor and outdoor use. We stock one of the widest ranges of electric wheelchairs. Modifications & customisations available. Our powerchairs provide the full advantages of cutting-edge technology with fully-modifiable power options, including powered tilt capabilities, powered seat lift and height adjustment, and machine-activated recline options. The seats themselves can be fully customised for a diverse choice of seating options and can even be modified to include posture controls and adjustment technology. Please call us with any questions on 0800 652 8533. Our stock is provided by the industry’s leading manufacturers including Pride, Invacare, Sunrise Medical, Electric Mobility and Handicare. 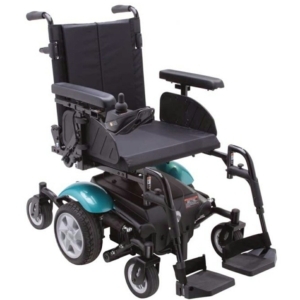 We offer several types of electric wheelchairs from rugged models for outdoor use to those with high-performance batteries that are capable of going long periods between charges. We stock front-wheel drive, traditional rear-wheel drive and newly-developed mid-wheel drive chairs that maintain a sturdy centre of gravity using casters in front of and behind the central drive wheels for a smoother, more manoeuvrable ride.